May 2015: Tyson Randall completes his MS thesis and degree. March 2015: The SAMPLE is deployed in Chico and Eureka. 20 March 2015: Upcoming Conference 27th ILRC. 4-page paper deadline: March 20. 13 August 2014: A visit this week from NCAR's Scott Spuler and Bruce Morley helped us get the original REAL (left) back into operation after the repair of a major internal component and improve the SNR of the second REAL (right). We operated both systems in Chico simultaneously for the first time. 4 August 2014: Masaki Hamada completes MS thesis. December 2013: Improved wind visualization web-application, for real-time/archives and both cross-correlation and optical flow algorithms - thanks to Chris Mauzey. Check it out! 16 July 2013: Dr. Jakob Mann from Technical University of Denmark to visit CSU Chico. He will give a seminar entited: How can Doppler lidars measure turbulence in the lowest part of the atmosphere? on Tuesday, 16 July 2013, 9 AM in PHSC 202. 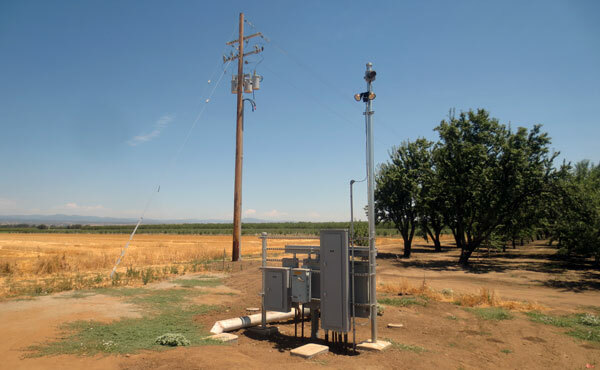 13 June 2014: Increasing Research Capacity: a new electrical power distribution system installed will enable us to run multiple lidar systems simultaneously. 320 amps at 240V are now available. Above: New PG&E pole and transformers and electrical panels and meters. 27 May 2014: REAL v2 up and running. The team below collected scans with aerosol plumes out to about 1.5 km range. Still more to be done in terms of optimization, but the system is certainly functional. Above (from left to right): Darrell Ramsey (Albuquerque, NM), Ryan Clare (Environmental Science), and Jason Stockton (Physics) upon completing several days of work to make REAL V2 operational. 15 January 2014: Doppler lidar removed from the REAL for shipping back to the UK. Check out the time-lapse animation below. 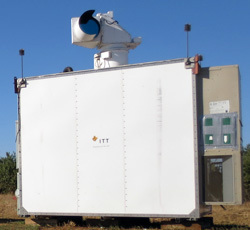 24 November 2013: Doppler lidar moved to roof of REAL container for the first attempt at spatial validation of REAL wind fields. 24 May 2013: An improved wireless network link to the REAL was installed courtesy CSRV and AO Wireless. 3 May 2013: The Atmospheric Lidar Research Group presented 3 posters at the 2013 CSU Chico College of Natural Sciences Annual Poster Session, one of which by Tyson Randall, won a People's Choice Award. 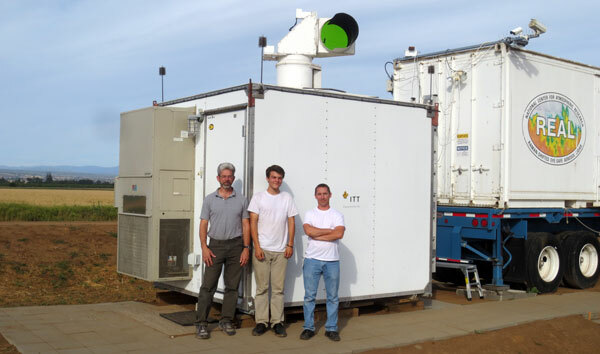 20 April 2013: A Halo Photonics Streamline Doppler lidar arrived at the university farm for our NSF-funded wind-sensing field experiment. 8 March 2013: Tyson Randall was selected to attend the 27th Annual Statewide Student Research Competition at Cal Poly Pomona on May 10 and 11, 2013. 25 January 2013: Improved transmitter optics configuration. 17 January 2013: New enhanced gold-coated gas-fusion beam steering unit mirrors delivered. January 2013: Dr. Mayor and Tyson Randall attended the 6th Symposium on Lidar Atmospheric Applications in Austin, TX, from 6-10 January 2013 and gave presentations. 10 December 2012: Dr. Pierre Dérian joined the lidar group on December 10, 2012. 6 November 2012 and handed in his thesis on December 3. 3 September 2012: Second Generation REAL arrives in Chico. Dr. Mayor and Jim Schafer attended ISARS in Boulder, CO.
Liz Jachens and Scott Gimbal presented posters at ILRC in Greece. Tyson Randall presented a poster at BLT in Boston. Dr. Mayor, Tyson, and Liz visited NCAR in late July. Students and staff in the lidar group presented 5 posters at the CSU Chico 8th Annual Poster session on Friday, April 20th.